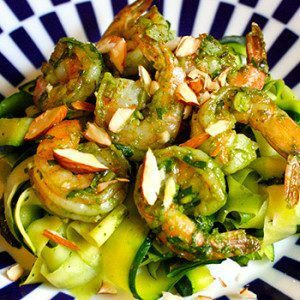 Zucchini noodles, sometimes called “zoodles”, can be made with a vegetable peeler, a mandolin, or a Spiralizer. Their pasta-like texture is a perfect base for all sorts of sauces and toppings. 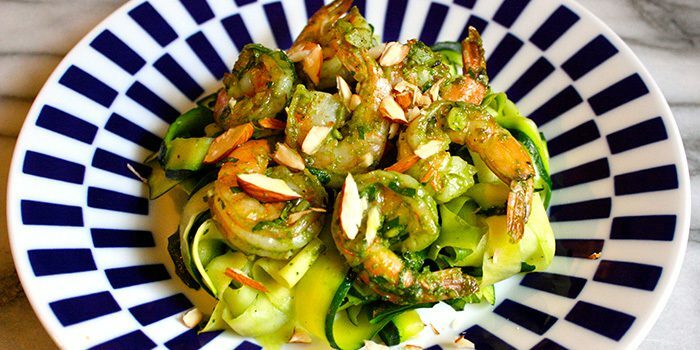 Try these delicious garlic shrimp with fresh basil on a bed of zucchini noodles tonight. Using a vegetable peeler, cut each zucchini into lengthwise strips about ⅛ inch thick. Turn each zucchini slightly after cutting each strip to work evenly around the outside, stopping when you hit the seeds at the core. Discard cores. Cut slices lengthwise into ½- inch ribbons. Set aside. Boil water in steamer or large saucepan over high heat. Reduce heat to medium-high. Place zucchini in steamer basket; cook for 2 to 3 minutes, or until tender. Remove from heat. Divide zucchini among 4 plates; top evenly with shrimp mixture. Zucchini can also be sliced with a Spiralizer or on a mandolin; adjust to a very thin slice.